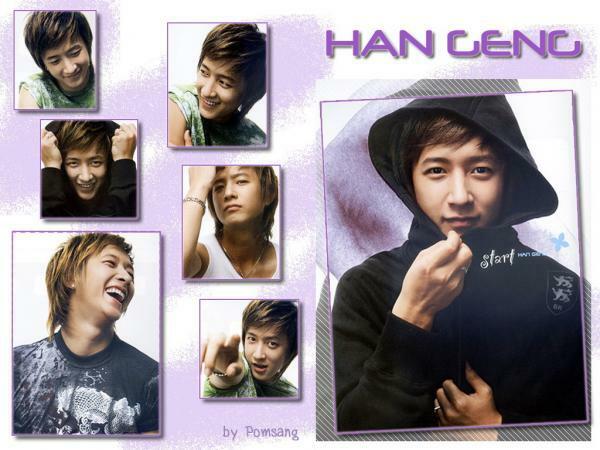 Trivia Fact: Han Geng is the only non-Korean Super Junior member, in fact he is Chinese. He can understand and speak Korean well, but he pretends not to understand when other members criticize him. Sometimes he isn't able to appear on certain Korean shows due to problems with his VISA. He used to live with Heechul and Kibum in a separate dorm from the other members. His idol is Andy Lau; he also admires Wang Leehom and Jang Donggun, and listens to Jay Chou and Fan Yi Chen. Likes Director Lee An. At the age of 12 learned tradional Chinese dance, karate, and ballet. On Hello Chat he was asked what the time he felt the happiest on stage was, he answered "SBS Inkigayo's first performance" (their official debut performance); on the same program they asked him who the scariest member of Super Junior is, and he said it is Kangin. Han Geng also said the member he is most thankful to is Siwon. Ideal Girl:Cute girl who respects his parents and loves him for who he is. He was choosen through an SM Entertainment talent search held in China in 2001. He is known for his dancing skills (skillful in Chinese traditional dances from 56 minority nations, for example). He is an ethnic Nanai. Han Kyung was discovered in 2001 at the H.O.T. CHINA Audition Casting 2001, where the competition rate was 3000 to 1. However, it was not until late 2003 or early 2004 when he arrived in Korea to receive private lessons in singing, dancing, and acting. It was not until a year later when he joined the other trainees in the company a year after that. In February 6, Han Kyung officially debuted as a member of Super Junior. He is one of the few members of Super Junior who actively appears on variety shows despite problems with his Visa, which prevents him from appearing on certain programs. Many allegations have surfaced claiming that Han Kyung is of Chinese nationality but of Korean ethnicity. However, he claims to be full-blooded Chinese. Typical of the expectations of a Korean idol, he maintains a slim frame, standing approximately 6 feet and weighing about 66kg (145lbs). He was featured in fellow SM Entertainment artist, Zhang Li Yin’s music video Timeless with fellow Super Junior member Choi Shi Won. he can't smoke! he has to take care of his voice! this is not allowed! hope he will understand it! I disappeared a while ago for a long time to make a movie , the concert moves as well , i do not have the time to come to see everybody.I thought about you these two days because the Thai situation was turbulent, changed the concert date ha-ha ~~~ . I may rest several days.Also hoped everybody paid attention to the body, the weather is more and more cold. btw...does somebody know what's the 4th song on han geng's pro? Super Junior member, Han Kyung, is rumored to be dating Chinese actress Liu Yi Fei. However, as we know, a dating idol star is a definite no-no. Han Kyung’s management, SM Entertainment, has denied the whole thing. Instead, SM stated that the woman in the picture is not Liu Yi Fei but Hwang Yi, an actress who will be starring in the upcoming drama, “Youth Stage” with Han Kyung. Both were captured exiting a restaurant after a staff dinner….